These Disposable Cell Counters are an enclosed chamber with two ports for sample introduction. 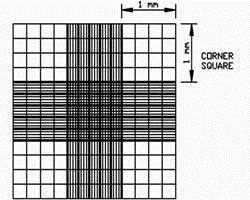 The chamber contains precisely spaced lines in a grid pattern. There are two counting chambers per slide for replicates. 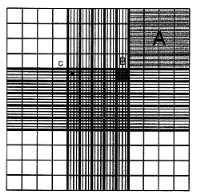 The counting grid pattern is the Improved Neubauer, as in a common Hemacytometer. The consistent pattern design allows the standard cell counting procedure to be followed. Under square A, B, C are 1x10-4 ml, and 2.5x10-7 ml respectively. Pipette 15-20 microliters cell suspension through sample port. Place Cellometer under optical microscope. Adjust focus on both the grid lines and the cells. 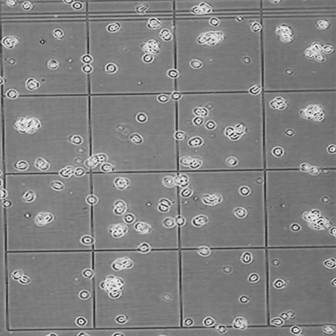 Count cells following standard cell counting procedures. Dispose cell counting chamber in bio waste.